They say don’t do it. They say that it’s really too much for one day unless you’re an expert, a mountain runner, or a certified lunatic. But they prefer you just don’t do it. 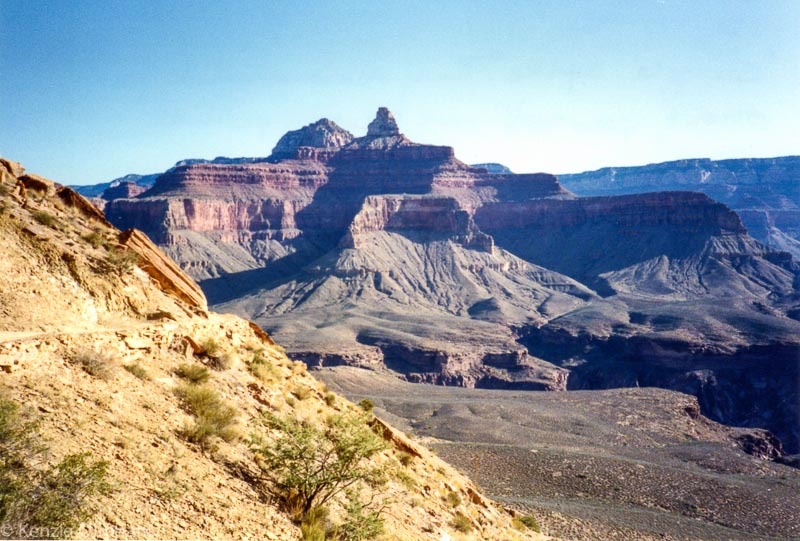 Hiking down and back up the Grand Canyon is almost the equivalent distance of a marathon – one in which the greater half is spent going up and up and up and up. And unlike climbing a mountain, the uphill part on the Canyon is done when you’re already tired from the hike down. 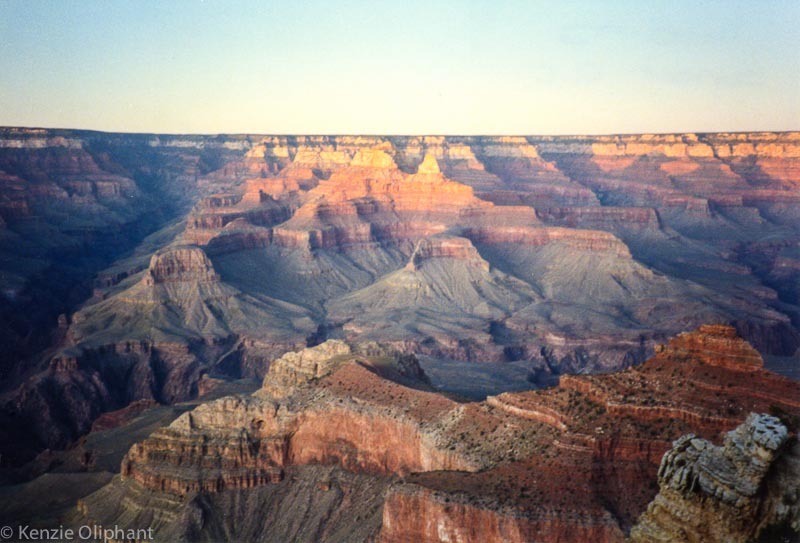 But I only had the one day, the one dream – to hike the Grand Canyon. I’ve never allowed a few unpleasant facts (nor apparently, common sense) get in the way of doing what I want. At least this time I wasn’t alone in my lunacy. My hiking companion, Berten was a twenty-three-year-old freshly minuted university graduate from Belgium. A trip to the USA was a break for him. His summers were usually spent taking American mountain-bikers on week-long cycling tours through the Swiss Alps. Out of our entire group, Berten was the only other person who wanted to hike – which was interesting given that, in all other respects he was quite intelligent, thoughtful and possessed of a great sense of humour. 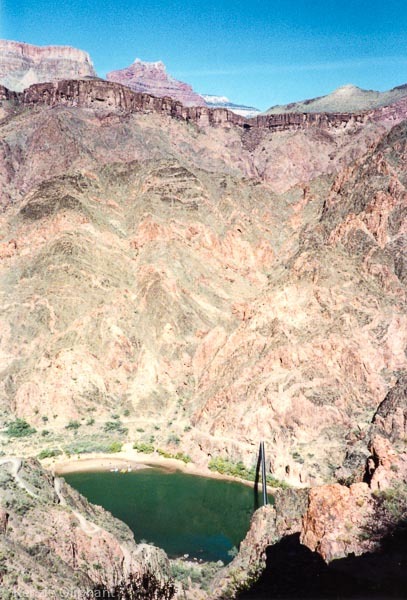 The others chose to take a brief flight over the Grand Canyon. (Typically, I wanted to do both but there was that whole thing about only having one day). 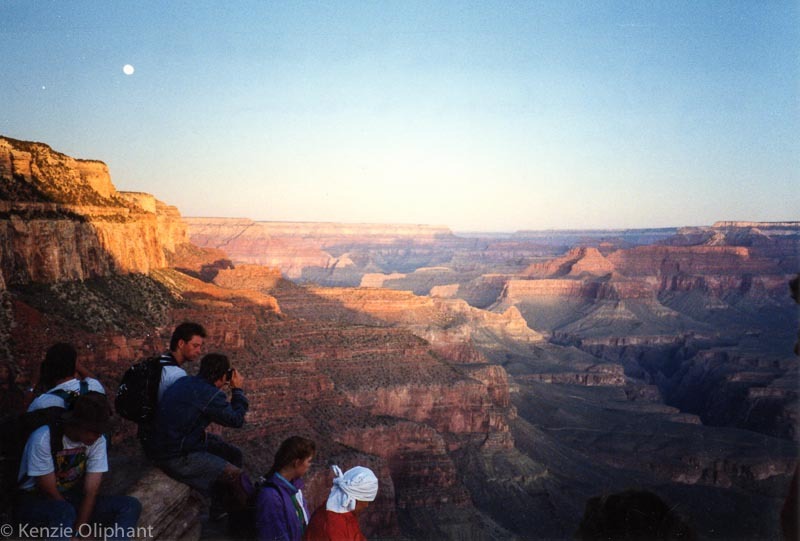 The evening before the hike, we all stood on the rim of the Grand Canyon and stared, dumbfounded at the view. The sky is sliced in half horizontally, as though a sharp but jagged blade has cut deep into the earth, randomly scooping chunks away. 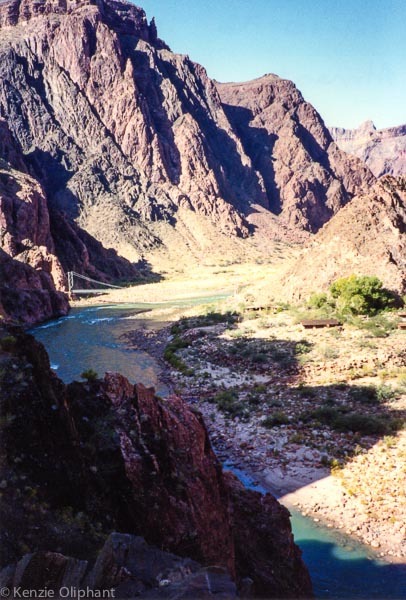 An earthy palette of colours blend and shape the myriad cliffs and valleys, and the Colorado River below is nothing more than a vague green smudge. The Grand Canyon defies every concept of size and forces you to re-evaluate what your eyes are telling you. The following morning, long before the sun rose, we filled our packs with water, snacks, sandwiches, flashlights, a thermal blanket and fleece jackets. A tiny – and as it turned out, wholly inadequate – first aid kit was also thrown in. I had on my Oakland A’s baseball cap I’d bought the previous week when I’d been to see their final game of the season. I also wore the pair of lightweight but good quality hiking boots I’d got that same day. They were really comfy. Having seen the Canyon the previous day, I was pretty excited to be doing the hike. Berten and I got a lift to the South Kaibab Trailhead and started hiking about half an hour short of dawn. With the path lit by flashlights and the palest glow in the sky, we joined about fifty others as they set out on the seven mile (11.3km) hike down to the bottom. 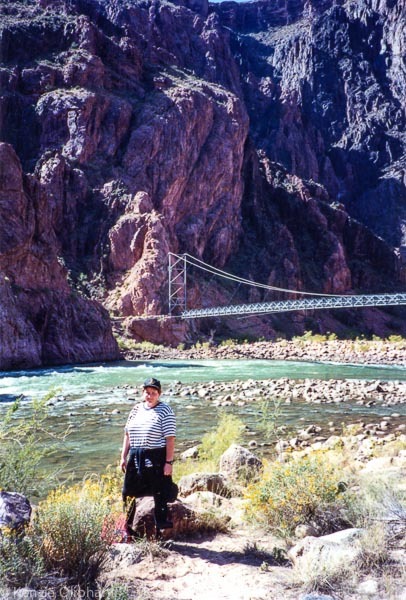 At first, I had to concentrate on where I placed my feet – the track is notoriously dangerous in the dark and the South Kaibab is the steepest on the South Rim. But as we walked, the crowds thinning out quickly, light began to gently spread across the sky and what it revealed was astonishing. Colours that in the sunset had been muted and greyed were, in the dawn, punched through the crisp air. Beige became bright yellow, brown a brilliant orange. It became steadily more difficult to watch where I put my feet because all I wanted to do was stare at the sunlight’s journey across the walls of the Grand Canyon. This was what I’d come for. I was in heaven. We hiked steadily for about an hour and a half, but it didn’t take that long for me to realised that my pace was about half that of Berten’s. He’d had strict instructions to stick by me (given I had ten years on him, more than a few pounds and I didn’t spend my holidays pedalling up the stiff slopes of the Alps) but he would still find himself a distance ahead and have to wait for me to catch up. He was so good about it. He didn’t once complain – although he suggested I walk a bit faster. But this was my comfortable pace and I really wanted to enjoy the walk. After a while, I let him to go his own pace. We could meet up at the bottom for lunch. He took some convincing, but it didn’t take long for him to become a bright green dot in the distance. 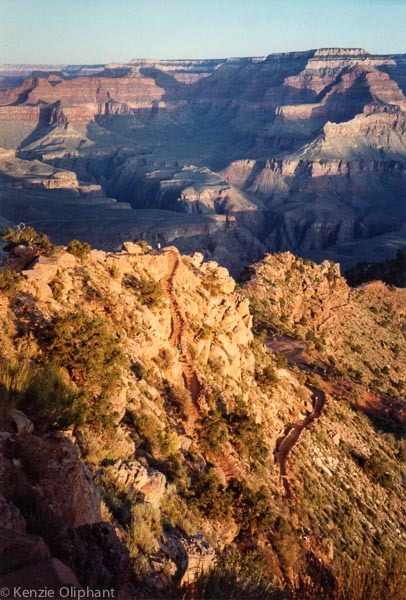 The South Kaibab Trail down into the Grand Canyon is pretty good. It’s steep but not unmanageable, with plenty of switchbacks to show off the ever-expanding views on every side. With each turn, the ice-green of the Colorado River grew closer and closer and although my knees were starting to get a little sore by the time I got to the bottom, I loved every minute of that hike. Right up until I arrived at the river and faced that horror – a suspension foot bridge, with slats that show you the river below even as you walk above it! Shudder!!!! I had no choice but to gird my loins and cross; Berten was somewhere on the other side and I needed to rest before starting the trek back up. But it took me a good couple of minutes to take that first step. I was pathetically proud of myself when I made it to the other side. I found Berten pretty quickly and we sat to eat and compare notes on our trips down. He’d done the whole thing in just over two hours. It had taken me four hours. So he’d been waiting two hours for me to arrive. Two hours where he’d sat around. Resting. Which was why, after only twenty minutes, he insisted we start the trek back up. It was only 11am. I wanted to rest longer but he was right – it was going to be a long walk back up (14.4 miles/ 23.2km) before it got dark at about 6.30pm. I agreed reluctantly. 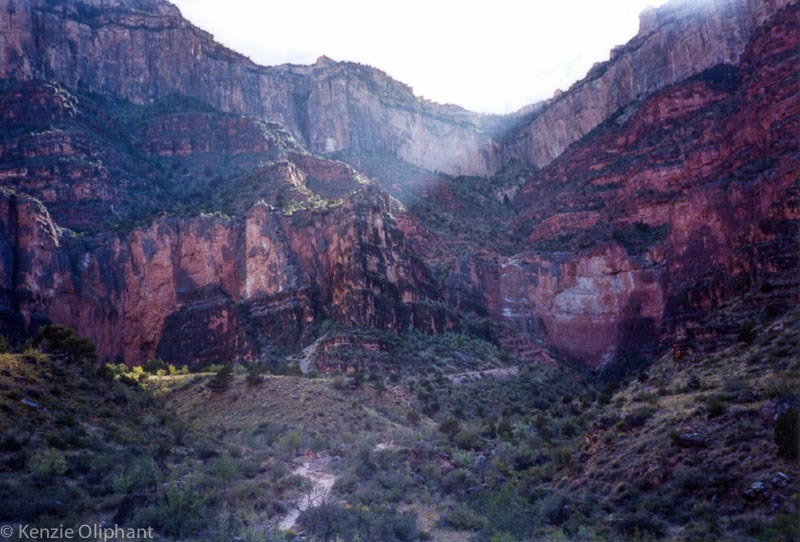 We set off at a good pace up the Bright Angel Trail, but only half an hour in I knew I was in trouble. I didn’t say anything to Berten, but I was struggling with the constant uphill. I tried to up my pace, but it never lasted long. Determined not to inflict this on him as well, I again insisted that he go at his own speed and off he went. An overwhelming depression swept over me. I couldn’t do it. I had more than 12 miles to go and my legs were already shaky and weak. How in hell was I going to get to the top without a long rest? And if I rested it would be way after dark before I reached the top. Starting before dawn, the sky just gets lighter. Hiking after sunset was lethal, because it just got darker. Even the Search and Rescue teams don’t set out on the trails after dark. I stopped to rest and consider my options. As I sat, other hikers strode past me, fresh as a daisy, waving or smiling a greeting in that open friendliness I’ve always found in fellow hikers. I envied their long hiker’s legs and their bright, happy faces. I was overheated, sunburnt, tired and short. In short, I was screwed. But then two things happened that got me to my feet. The first was the full realisation that I had no choice but to go on, and feeling sorry for myself would only make the next eight hours intolerable. So I decided to just embrace my fate and instead, do all I could to equally enjoy the trip back up. After all, I was still in the Grand Canyon, one of the most beautiful places on earth. The second thing was the unmistakable clanging of bells, warning me of an approaching donkey train heading home. What got me moving was the sudden vision me sitting on one of those poor animals as it heaved me up the unending slope! There was no way I’d accept that kind of defeat! I may be a fool, but I’m not coward. I got myself into this, I would get myself out. So I got up and carried on. Slowly but surely, putting one foot in front of the other, filling up my water bottle whenever I could, keeping to the shade when there was some available. I took out an orange and ate it as I walked – it took me an hour to nibble at it. My body wasn’t interested in food. All my resources were focused on keeping my legs moving. A couple of hours later, the first blister on my heel burst. That heralded an avalanche of more blisters and sore spots that swiftly exhausted my first aid supplies. The thin socks I’d so stupidly worn became stained with blood and red ochre dust and did nothing to prevent further damage to my feet. I was still three hours from the top when the shadows revealed a mere two hours until sunset. I was alone on the trail now; the other hikers had passed me long ago. I should have been horrified by that, or at the very least, a bit scared. But I was either a lot braver than I’d expected – or more likely, fear required far more energy than I could spare right now. Instead, I began keeping a lookout for places I could shelter for the night, spots where I could gather firewood or leafy branches to use as blankets. Admittedly, there wasn’t much available – but thinking positively about how much control I did have over my worsening situation actually kept me going. But an hour later even those reserves began to flag. I was walking even slower, but I was in pain from my feet, my back and the sunburn that spread across my cheeks despite my determined efforts at protection. I began to wish I was just done, at the top already. That it was all over. I wondered whether I should stop now and find a place to spend the night while I had light and enough energy to do it. But I never wished I hadn’t done the hike. Not once. I didn’t stop. I’m not sure I could by that point. My body was on auto pilot, one foot in front of the other, mindlessly trudging along. All I could think about was how bad I felt, how each step was excruciating, and thinking about it of course, just made me feel worse. I thought of Berten, surely now happily at the top, lounging about, probably chatting with others who’d made it. I was glad for him – but I couldn’t help wishing that he was still with me, so that he could talk to me and take my mind off my aches and pains. Then the strangest thing happened. No sooner had I finished the thought when I heard this voice calling my name, again and again. I stopped and looked up. High above me on one of the many switchbacks I had yet to hike, an anxious face peered down at me. He waved and yelled something I didn’t quite get and then as quickly disappeared. Vaguely confused, I resumed my trudging but after a preposterously short time, he appeared on the trail before me (I found out later that he’d run about two miles down to find me). “What are you doing here?” I asked. Apparently I still had enough energy to smile and look pathetically relieved to see him. “I’ve been waiting at the top for you, checking with every hiker whether they’d seen you. I ran out of people to ask so I figured I’d better come down and find you.” He said all of this in impeccable English, accented beautifully with his native Flemish. I’m not sure I’ve ever been so happy to see anybody. With kind but very firm words, he got me walking again, keeping to a slightly faster pace and most importantly for me, talking about his home, his family, his hopes for the future. I tried to respond in kind, but I was beyond more than brief statements. The sun began to set but he never stopped and wouldn’t allow me to. He never told me off, but kept encouraging me. He understood my exhaustion, but wouldn’t allow me to give into it long enough to rest. 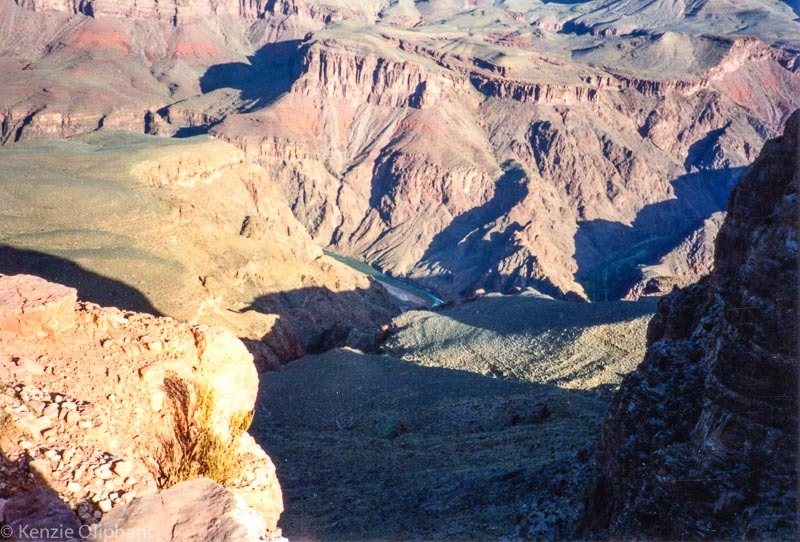 It was not long after dark when we finally reached the top of the Grand Canyon. Berten sat with me for a moment, but when he found out that there was another girl still on the trail, he headed down to help find her. Half an hour later he was back. It was a false alarm: the girl had never started hiking in the first place. That evening, around our campfire, Berten regaled the group with tales of our trek, but left out how he’d come back to help me, and how he’d selflessly gone down to help somebody he didn’t even know, hiking untold extra miles. I wanted to tell everyone, so they could all admire him and see what a great guy he was. But to do so would have been to admit that he’d left me in the first place, which he’d promised not to do. So I never said anything. The next morning as we left the area, we stopped by the Canyon rim so the others could watch the sun rise. Berten and I, aching from every muscle, barefoot to save our bruised and bleeding feet, hobbled like a pair of wrinkled pensioners over to the edge to gaze out over the glowing vista. “How do you feel this morning,” he asked without looking at me. “The same,” he smirked. The admission – like his help the day before – made me feel like I wasn’t alone in my misery. So there I stood, looking out over an icon I’d dreamed about for so long. 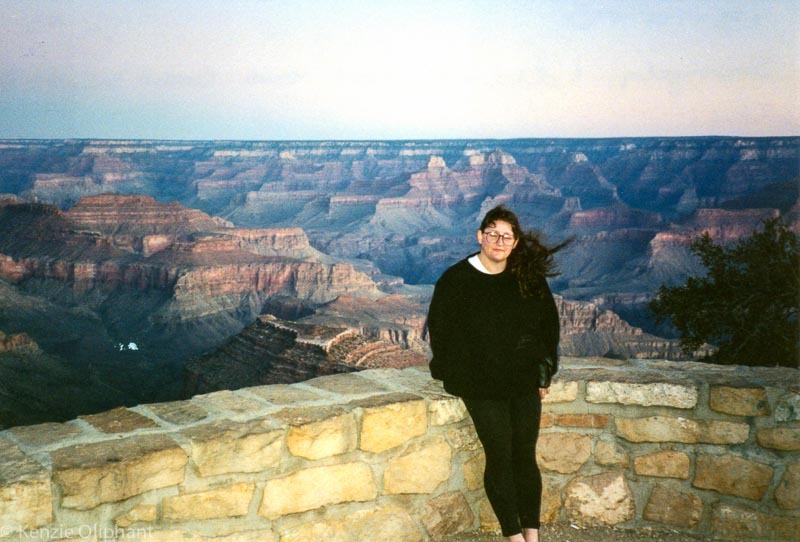 Me and the Grand Canyon, the Grand Canyon and me. The South Rim Pocket Guide is a great tool for all visitors, whereas the Backcountry Hiking Guide is an excellent resource for anyone wanting to take the plunge and pull on those (well-worn) hiking boots. Both can be downloaded in PDF format. The Grand Canyon is well worth a visit, even if you don’t hike – although I recommend you hike even a little way down, just to get a better view. The best resource of information is the National Park Service website, which will tell you everything you need to know about visiting, including details such as the free shuttle bus to each trailhead, what to take with you and what times of year to go.